For the first time in the West, The Masters of Cinema Series is proud to present the complete 183-minute original Japanese cut of Masaki Kobayashi’s Kwaidan — one of the most meticulously crafted supernatural fantasy films ever made. 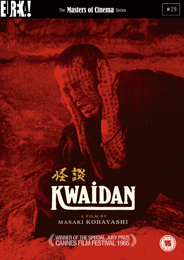 Starring Tatsuya Nakadai (Yojimbo, The Face of Another, Harakiri), this complete print of Kwaidan — incorporating 21 minutes of footage never before released to Western audiences — also includes the uncut version of “The Snow Maiden”, in which a woodcutter marries a woman whose true calling is to wander enveloped in swirling snowflakes, bringing death to mortals. The episode marks the apotheosis of the film’s eerie atmosphere — anticipating, and arguably surpassing, Japanese cinema’s recent excursions in the realm of “J-horror”. Over forty years on, Kobayashi’s film remains an unparalleled achievement.